There was a blizzard, so I gather, outside our hotel in Portsmouth, NH last night. But we went to bed after driving in as the snow fell lightly, and by the time we left this morning the lot was plowed, as were the streets and highways. It was only when we had to guess where the driveway was up to the house (and got it wrong) that the depth of the snowfall became really evident. (It took 45 minutes to get us dug out). 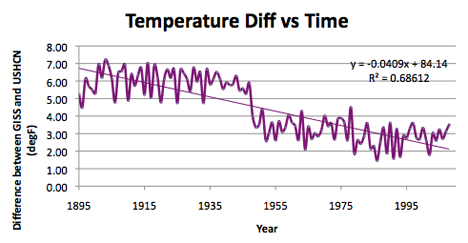 Which is a good reminder that it is time to get back to the changes in temperature over the years. And I was looking at the other side of the country, where they also know how to deal with large snow falls. 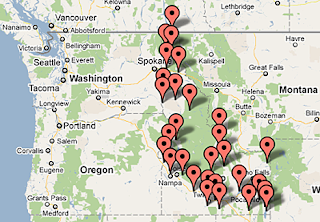 Idaho has 29 stations in the USHCN, and a quick glance at the distribution suggests that there are more stations in the southern half of the state, than vice versa. 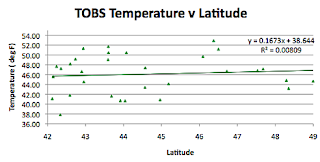 Downloading the data, as previously, into a spreadsheet, and noting that indeed Idaho is a relatively elevated state, I turn next to the GISS data, and there are, according to Chiefio, two GISS stations now being used in Idaho, at Pocatello, and at Boise. Pocatello just has data since 1947. A quick check on the GISS site says that the next station is the one at Aberdeen, which is 19 km away, so this is the right one. .Boise, on the other hand, has a full set of data from 1880 on. 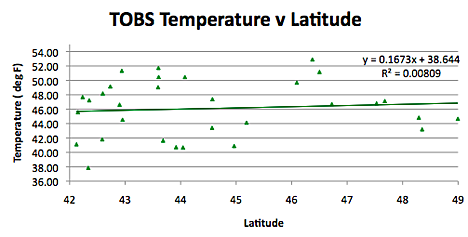 Boise ID GISS station temperatures. 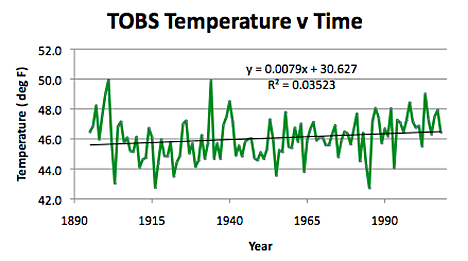 Interestingly it also shows that 1934 was a lot hotter than now. Incidentally there has been some discussion at both Climate Audit, and WUWT relative to the adjustments that GISS make to their data. You have to dig deep into the comments at the WUWT story to get the explanation as to why GISS values for the years keep changing (Eric Smith comments at 9:42 and 9:55 pm and then at 10:09 am on Dec 26th) The latter points to a post wherein Eric Smith (Chiefio) shows how data manipulation can keep temperatures rising, after a record temperature has been set and not broken). As part of that discussion, there is the comment that GISS is tending to marry a short-lived station (post 1930’s) with a longer one in order to emphasize the recent rising temperatures which are more evident with the short term station than the longer term. We saw this pattern in Oregon, and here it is again. Arrowrock station by a dam. So I give this a population of 100 – though that is not strongly defendable. 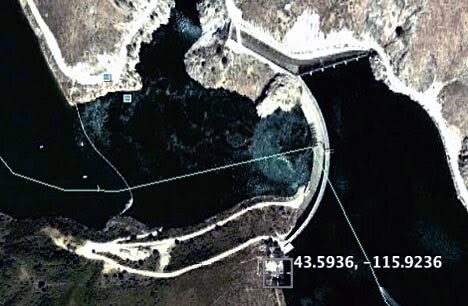 Yet looking at earlier plots of population, the dam sites seem to lie consistently above the line, suggesting it is equivalent to a larger population than that picked. Bern also needs me to go look on Google Earth since it is too small for citi-data (which seems to only related to places at a level of more than 100 folk). There are a couple of dozen houses that are close, so again I’ll use 100 as the population. Dworshak Reservoir has 305 according to a reference though again too small for citi-data. Fenn similarly, where a site gives a population of 40. Lifton has about 6 houses, and what may be a boat dock, and some apartments (via Google Earth – not much else) so I put down a population of 50. Porthill, which had a population of 126 in the 2000 census, now has no-one living there. But since someone is reading the numbers I will put down 1. (The numbers from citi-data –see, for example, Priest River are from 2009. In regard to the geography of Idaho the state is 475 miles long (N-S) and 305 miles wide. 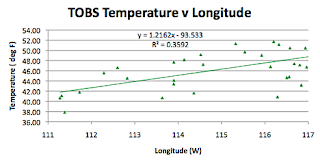 The Longitude runs from 111 deg W to 117W, and from 42N to 49 N. The highest point is 12,662 ft, (3860 m), with a mean elevation of 5,000 ft (1,524 m) , though the lowest point in the state is at 710 ft (216 m). 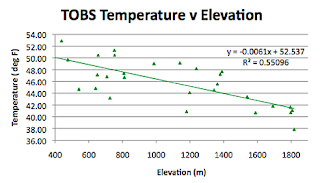 The average station is at 1,087 m (including the GISS stations). 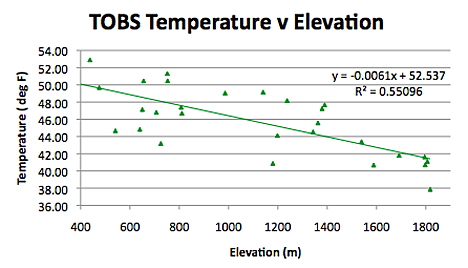 There are 6 USHCN stations above average elevation, the GISS stations are not. So how do the temperatures of the state compare? 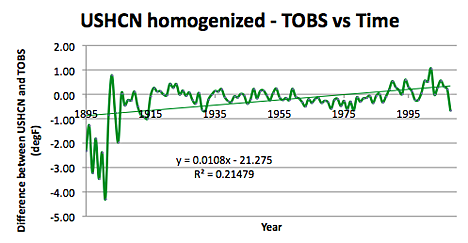 Starting with the difference between the GISS stations and the homogenized USHCN, the average difference, over the century, is that the GISS stations are showing a temperature 4.42 degF hotter than the average for the USHCN. Difference between the average temperatures recorded by the GISS stations and that of the homogenized average data from the USHCN stations in Idaho. (Note the change when the second GISS station record is added). Looking at the overall temperature change in the state over the century, and switching to the TOBS data set, since this does away with the adjustments that occur with homogenization. 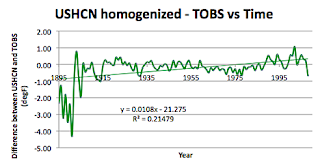 The temperature rise for the TOBS modified raw data over the period has been at the rate of about 0.8 degF per century, whereas the homogenized data suggests that the rise has been on the order of 1.5 degF over the same period. Turning to the impact of geography on temperature, the state is more sparsely populated than many in the study vide the amount of extra searching I needed to do to find the populations of some of the hamlets), but let’s see how that plays out. Against the general trend here there is an increase in temperature as one goes North. Perhaps an artifact of the locations and their elevation? As I noted earlier the stations in Idaho seem to be located in more places with very few residents than I have found in other states. 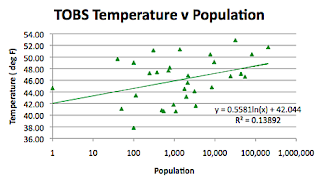 Yet there remains a good correlation with population across the spread of the plot.